A Grade-5 student in Abu Dhabi has created a marine cleaner robot that can remove waste from seas and oceans and provide vital protection to marine habitats. 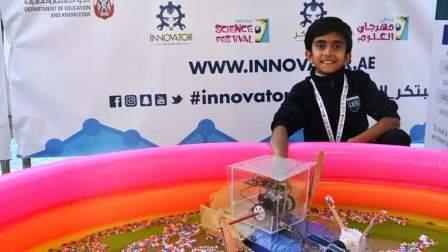 Sainath Manikandan, an Indian student at the GEMS United Indian School, Abu Dhabi is showcasing his "M-Bot Cleaner (Marine Robot Cleaner)" project during the Innovator 2018 which is part of the UAE Innovation Month 2018. "My innovation, M-Bot Cleaner, intends to provide vital protection to the marine habitats as it removes waste from water surfaces and facilitates cleaner waters and improved marine life. I am working towards Sustainable Development Goal 14 (SDG-14) to conserve and use the oceans, seas and marine resources for sustainable development," said Manikandan. The event, which is being organised by the Abu Dhabi Department of Education and Knowledge (Adek) at Abu Dhabi Corniche, aims to nurture creativity and entrepreneurship within the UAE community and also encourages the spirit of innovation among young people in the UAE. Manikandan innovation project is a prototype robot in the shape of a boat and floats with the aid of recycled water bottles. It can be operated remotely with a radio control. He explained that popsicle sticks are attached to two pencils which are in turn connected to the two DC motors that serve as a paddle to the boat to move in the water. A wheel with popsicle stick is connected to the third motor at the front to push the waste from the water bodies into the storage basket. Additional features can be enhanced by having solar panels instead of batteries and having GPS to send signals to M-Bot to move to a particular location in the ocean/river to collect wastes. Although this project could plausibly restore the purity of water, it nevertheless could be the initial step taken forward towards creating a better ecosystem. "We live on a blue planet, with oceans and seas covering more than 70 per cent of the earth's surface. Oceans feed us, regulate our climate, and generate most of the oxygen we breathe," said Manikandan. The youngster said citizens of this world must work together to create a more sustainable place for human beings and also for all living creatures. His robotic kit included items such as CPU, three DC motors, three wheels, 6V battery case, remote transmitter, receiver board and cables. He spent Dh550 on buying other materials. Adek opened the UAE Innovation Month in Abu Dhabi last week.